PT Selamat Sempurna Tbk is one of the leading filter and radiator manufacturers in Indonesia. This automative component manufacturer also manufactures a wide range of other automotive component products including oil coolers, condensers, brake pipes, fuel pipes, fuel tanks, exhaust systems, and more. Selamat Sempurna, which is part of the ADR Group, mainly operates in the secondary market of the country's automotive industry (aftermarket). Its brands include Sakura, ADR-Radiator, ADR-Brake Parts, ADR-Coolant and ADR-Dump Hoist. The company is known as "the king of the filter manufacturing industry" in the region. Roughly 70 percent of the company's revenue originates from export to markets abroad (it has over 115 export destination countries), mainly to the aftermarket segment. 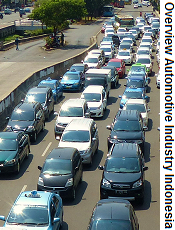 As the company's main business activities involve the production of automotive parts or car components, a closer look at Indonesia's automotive industry is required. Selamat Sempurna conducted a four for one stock split from a nominal value of IDR 100 per share to IDR 25 per share, effective per November 02, 2016.